I never met my grandparents on my mother’s side. Hardly a day went by that Mom didn’t mention them, but of course I have more questions about them than answers. So, it was a very pleasant surprise to find out that grandpa left behind a few travel journals. One relates the story of a trip to central America in 1950. Okay, so it might not be all that obvious why this should be interesting to me or anyone else for that matter. I probably won’t be traveling on the Great White Fleet any time soon, and who has even heard of United Fruit? They probably don’t even exist anymore, right? Well, they don’t. That’s true. If you’ve eaten a Chiquita Banana, then you’ve some familiarity with their progeny, but United Fruit itself doesn’t exist anymore. In the 1950s, though, they were going good and strong. United Fruit was more than a business. It controlled much of central America and helped give birth to the phrase ‘banana republic,’ which I suppose means it has yet another descendant of sorts in the business world. In just four years, United Fruit and the Central Intelligence Agency would engineer a military coup in Guatemala, one of the nations my grandparents visited on this trip. Two of the ships in United Fruit’s Great White Fleet would later be used in the Bay of Pigs operation. Clearly, United Fruit did a lot more than grow and sell bananas. They would eventually be forced to sell off their monopoly interests in Guatemala, and then merged with another company to become Chiquita. In the meantime, Grandma and grandpa were free to enjoy the hospitality of the company on the Great White Fleet. It’s just a travel journal, to be sure, but a travel journal into the heart of American imperialism. Suffice to say, this was enough to peak my curiosity. I can’t say the journal was overflowing with details of military juntas and revolutionary conspirators. That’s not what Grandpa and Grandma went down there to see, and this isn’t exactly my area, anyway, so I may have missed a thing or three. Most of the journal seems like pretty normal stuff for travelers. Its pages are filled with tales of mundane trips about the countryside, meals enjoyed (or simply ensured), beautiful architecture, run-down hovels, archeological sites, and countless random travel companions, most of which slide onto stage and back off without too much fuss. Yet there are a few notable passages. Apparently, my grandparents hit a cow somewhere near Chichen Itza (pic 70). Grandpa also mentions meeting a young man in that area who had been to Peoria, IL during the war (pic 76). I can’t tell enough from the narrative, whether the man is even local, or perhaps an ex patriot, but I wonder if this wasn’t someone who had come up on the Bracero program (workers brought into the U.S. to replace Americans gone to war). Either way, I expect there would be an interesting story there. They encountered the President of Honduras (Juan Lindo?) whom they were evidently told had been too democratic to live in the President’s Palace. He tipped his hat to someone in their party. (You can read Grandpa’s account of this on pic 55). Grandpa mentions a banana shaped menu once in his journal (pic 46). Pics 14 and 15 would seem to fit the bill. Oddly enough, I don’t see bananas all over the menus, which is interesting. Under the guidance of Edward Bernays, the father of modern Public Relations, United Fruit made an effort to broaden people’s ideas about when and where to eat bananas, a campaign which included (for instance) reversing ideas about whether or not parents should encourage snacking. I really did expect to see a lot more gustatory propaganda on those menus, but mostly the fruit (which would have been the Big Mike), seems to show up in pictures and other visual motifs. 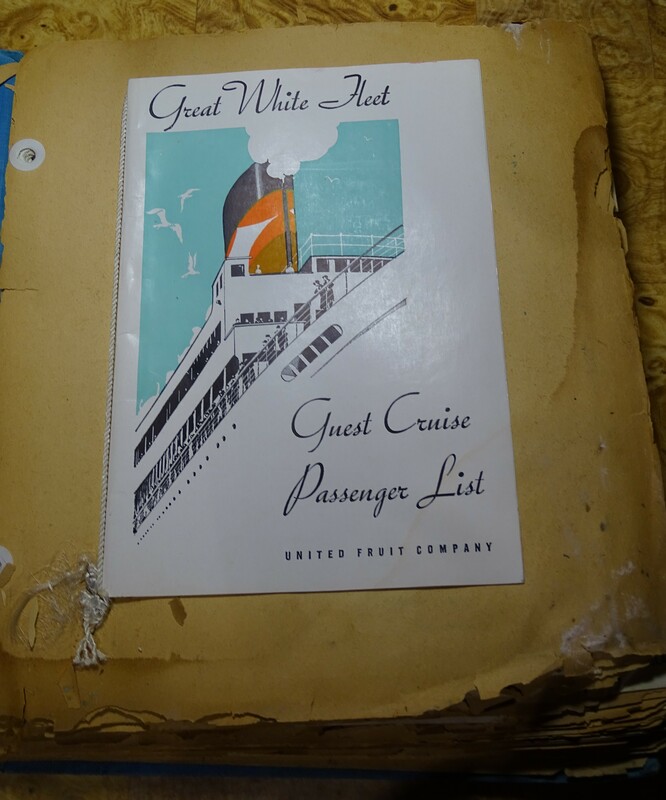 There is an interesting little history of the Banana, according to United Fruit (pics 17-19), and nice overview of the travel services aboard ships of the United Fruit Company (29-45). Oddly enough, this does not mention any of the company’s efforts to monopolize the entire national economies of several of the countries on the itinerary. A couple of these pamphlets include references to ‘Middle America’. (I think these were menus.) I found the phrase amusing enough, wondering what folks in Oklahoma or Nebraska might make of it, but of course our North American fashions of speaking about ‘America’ can be a little odd once you shift references to include the whole hemisphere. More interesting than that, the phrasing matches a news agency developed by Bernays for the purpose of promoting the interests of United Fruit. The Middle America Information Bureau had gone dormant by 1950, but I do find myself wondering if the phrasing doesn’t reflect some conscious reference to that project. And then of course there are just a couple cryptic references in Grandpa’s journal to a rather large layoff by United Fruit coupled with the observation that communism is coming in fast (pic 54). I could easily wish for more. I could wish Grandpa had uncovered a great big smoking gun, or that he had left behind a complete account of the political history of the region, but alas, he was just a tourist along on a vacation. His politics were not mine, and he didn’t know the history of the company. He mostly wrote about the meals and the sites, and the friendly chatter with people he met here and there. It’s me that sees these documents nearly 70 years later and thinks about all the history of the company that took him down there, but perhaps there is an interesting lesson here after all. This is what the imperialism of the day looked like to people like my Grandpa, to guests of United Fruit. It was central Americans that witnessed the violent side of United Fruit. For so many (North) Americans, it was simply slices of fruit a mother may have wanted to put on bowl of cereal. Or perhaps it was a quaint news story about a far away place, and perhaps reasons Uncle Sam needed to help fight the red menace somewhere else. Living here in the United States, the majority of Americans would never have felt the blunt force of this company’s power. Neither would they have seen it in any recognizable manner. What they saw was always this benign. Whatever else can be learned from Grandpa’s journal, it seems we can learn the same was true for countless American tourists traveling through the region. United Fruit is all over the literature in this journal. Details that would one day matter can be found here and there, along with rumors that even reached the ears of a passing tourist. Still nothing recognizably nefarious pops up in the journal, at least not to the eyes of tourists such as my grandfather. What we can see is a range of pamphlets, dinner menus, and brief canned histories, all of which make the whole region seem so innocent, and so quaint. To so many (North) Americans, that banana shaped menu is presisely what our imperial age did look like. I could of course rest happy thinking that we are better and wiser today. This is all behind us, right? Then again, we sometimes get a little reminder that there is nothing new under the sun. Too Democratic for his palace! This is hardly a research paper, but I thought it might be worth mentioning a couple sources here. I first Read Bitter Fruit as a teaching assistant to a professor who specialized in Latin-American studies. Somewhere along the way, I picked up a couple other books on the subject. Bananas makes a particularly nice quick read with a lit of interesting details on the history of United Fruit. Cohen’s books is also useful. Galeano’s book helps to draw connections between different regions and phases of history, all with a very pointed sense of significance. The Bernays angle on all this stuff is particularly interesting. His book Propaganda, is still considered a classic in the history of Public relations. It’s a good peak into the kind of techniques the man used in selling United Fruit and its interests to the American public. Bernays, Edward. Propaganda. Broooklyn, New Yok: IG Publishing, 1928, 2005. Chapman, Peter. Bananas: How the United Fruit Company shaped the world. Edinburgh, New York, Melbourne: Canongate, 2007. Cohen, Rich. The Fish that Ate the Whale: The Life and Times of America’s Banana King. Farrar, Strauss and Giroux, New York: Picador, 2012. Galeano, Eduardo. Open Veins of Latin America: Five Centuries of the Pillage of a Continent. New York: Monthly Review Press, 1973, 1997. Schlesinger, Stephen and Stephen Kinzer. Bitter Fruit: The Story of the American Coup in Guatelama. Cambridge and London: Harvard University Press, 1982, 2005.